The first decision you need to make before building your new Antsy Pants™ stash is what size to purchase. We've tried to make that easier by creating a cloth diaper with built-in size flexibility, with multiple stretch elements built right in. These features help Antsy Pants™ fit far longer than one clothing size would, with the S/M/L size range fitting children from just a few months of age up to around age 9 with only 3 sizes. Purchase size S if your child wears up to size 2T clothing. Purchase size M if your child wears from 3T to size 5 clothing. Purchase size L if your child wears from size 6 to size 9 clothing. If you need XL in this style contact us at for a custom order. Waist Circumference - Your child's waist circumference should be at least the same as the relaxed waist measurement of the diaper (see details on how to measure at the bottom of the page). Hip Circumference - Your child's hip circumference must be smaller than the maximum waist circumference of the diaper. It's Good To Have a Waist - Near the small end of each waist size range, Antsy Pants™ will stay in place much better if your child's hip circumference is larger than her waist. Rise Length - Your child's rise measurement should be at least that of the diaper to be sure there won't be gaps at the leg openings. (Rise length is the skin measurement from front to back waist passing between the legs right where the leg joins the torso). It's OK for your child's measurement to be longer than the stated relaxed side rise. 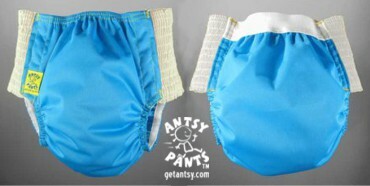 Primary Use - Will your child wear Antsy Pants™ for day only, mostly for night or both? If it looks like your child could wear two different sizes and you will often use them for night, purchase the larger size. When a nighttime insert is added, the rise will measure approximately 1" shorter than the above measurements. If you are still unsure about the correct size of Antsy Pants™ to purchase for your child, taking a few of your child's measurements would be the next step. The three measurements you need are waist circumference, hip circumference and rise length. The easiest way to be sure you get these two measurements in the right spot is to tie a ribbon or string around your child’s waist and use it as a guide for both measurements. Waist circumference is measured around your child’s torso at the natural waist. This should be lower in the front (below the tummy) and higher in the back (at the small of the back). Rise length is measured between the center front and center back points of the above waist circumference, passing between the legs and flat to the skin at the point where the leg joins the torso. For the most accurate fit possible, our sizing suggestions reflect this measurement taken without a diaper or other clothing on. Need more help? Send us your child's age, height, weight, measurements and clothing size and we will help determine those close calls. Our email is .